Leave a message for CROWLEY family members. 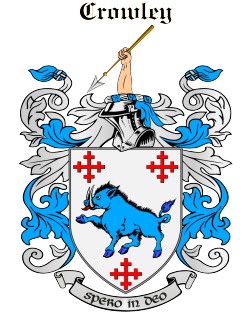 Hi, my name is Sue...my ancestors are David Crowley and Catherine Mehegan (Kilbrittain) Ireland. Their son James David Crowley was my great grandfather who was born 1843 Kilbrittain Ireland and emigrated to Victoria Australia in 1868 aboard "southern cross" and died in Corowa NSW 1900. Married to Catherine Cameron in 1874 in Wallan Wallan, Victoria Australia, They had 7 children. Invite more CROWLEY family members! Click 'Invite' to connect with more members of the CROWLEY tribe.